We are delighted to welcome as September 2010 Author of the Month, researcher and writer Brien Foerster. 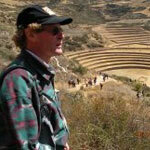 Brien’s study and insight into the Inca’s ancient origins shed a new light on that famous South American culture. The implications are both startling and far reaching suggesting a connection to a pan Pacific civilization reaching back to mankind’s most distant past. Join the discussion on the Author of the Month Message Boards here. I have always been fascinated by Indigenous cultures. As a child growing up on the west coast of Canada, I developed a keen interest in native Haida and Kwagiulth art and oral traditions, when my grade 4 teacher read native “myths” to my classmates and me. What struck me, even at that early age, was the way that the indigenous story writers treated all of creation, whether animal, plant or human in form, as being equal; there was no social hierarchy as compared with European story-telling. Raven, human, salmon, and cedar tree, for example, are treated as being on the same intellectual and spiritual level, while European stories anthropomorphise animals, and definitely treat them as being of a lower order of life. This led me to learn to carve totem poles and other wood arts from native mastercraftsmen, including my adopted uncle Jim Gilbert. My native inspired sculpture became a full time profession for me at the age of 25, and continues to this day, in a somewhat muted way. A university degree in biology was cast aside so that I could live this passion. At 36, I moved the island of Maui, Hawaii, and spent two years with a mainly Hawaiian crew building a double-hull sailing canoe, the “Mo’okiha O Pi’ilani “ ( Sacred Lizard That Pierces The Heavens.) At the same time, in order to make a living, I learned to make outrigger racing canoe paddles, and now 2500 of these are in use from Japan to Germany, and northern Manitoba, Canada, to Rio de Janeiro in Brazil, with many points in between. This was more than 10 years ago, and coincided with my introduction to the works of Graham Hancock and Robert Bauval. The big Hawaiian canoe, under the construction and design guidance of Keola Sequiera, was based on Sacred geometry and his own study of Graham’s research. The study of Polynesian origins was of course a major aspect of the canoe, since it is well known that the Hawaiians came from Tahiti originally. But what about the sweet potato, which is prevalent throughout Polynesia, and is known to have come from Peru; or Totora reeds, found on Easter Island ( Rapanui) but native to Lake Titicaca? Since my studies in Tahiti satisfied my interest in the Polynesians ( for the time-being at least) what else could possibly be as interesting? I had already satisfied my need to visit the lands of my own ancestors in Europe, and Egypt seemed to be almost analyzed to death, so Peru became my focus, and more specifically, the largest civilization in all of the Americas, the Inca. Quite coincidentally, I began to develop a relationship with a young woman, now my fiancée Irene, who is Peruvian. She invited me to visit her family in Lima, which I did, and travelled quite independently for over a month all over Peru. While this small country has an amazing diversity of ecological and cultural habitats, it was the Sacred Valley of Peru that captured both my heart and intellectual fascination. The amazing precision of their seamless and mortar free stone masonry, exacting celestial observations, and complicated but humane societal structure was not only fascinating to me, but has been the subject of scholars and academics for 500 years. On this first trip, I scoured the bookshops of Cuzco for a nice, small, and affordable book, in English, that described the Inca culture, from origin to their downfall, with no luck. How could this be? There were beautiful full colour “coffee table books,” and scholarly treaties, but no small pocket books that satisfied my need. Upon my return to Canada, I continued to learn what I could from library books and the internet about the Inca. And on 6 more trips to Peru over 3 years, my taste for Incan information was still not quenched, and the elusive little Inca book was still nowhere to be found. So, upon the encouragement of my fiancée and her family, I began to compile what would become “A Brief History Of The Incas” in the winter of 2009/2010, and had the book published in Lima in April of this year. I chose a Peruvian based publishing company because the owners are friends of my Peruvian family, and since the topic is the Inca, as much of the business side of the book should profit the descendants of their land. The main question that really puzzled me after much research and “on site” observations was, how could 160 mainly untrained Spanish soldiers of fortune defeat an army of at least 10,000 trained Inca warriors? Even ( and pardon the bad joke ) if each of the Inca soldiers had one rock, or indeed a potato, they could have stoned ( or potatoed ) the Spanish to death. The answer to this question is much more complicated than most people realize, and why it takes up almost one half of my book. I obviously will not give details of this, because I want you to read the whole version, and to do that you have to buy the book! However, in a nutshell, as they say: from the dawn of the Inca civilization about the year 1200, until the reign of Huayna capac, about the year 1527, one thing was certain; the title of Sapa (highest) Inca was always transferred from father to the eldest son. The logic behind this may have been that since the Sapa Inca had to be knowledgeable in all aspects of Inca society, from warfare to government to agriculture and religion; his training had to begin almost at birth. Therefore, to concentrate this education in the first born male heir made sense to them. However, due to the introduction of western diseases that spread through the native population beginning in Panama, where the Spanish had a strong presence, down through Columbia and then Ecuador, Huayna capac and his first born son, Ninan cuyochi, both became infected. They were living near Quito, Ecuador at the time, more or less the northern border of the Inca civilization, called the Tahuantinsuyu (four corners of the world) and it was here that Huayna capac’s favourite, son, Atahuallpa was born, of a royal Ecuadorian mother. Ninan cuyochi died first, and this left Huayna capac with a true dilemma; the chain of father to first born entitlement was now broken, so what could he do? As the Tahuantinsuyu was now at its height of size and power, stretching from Quito and its northern environs south to present day Santiago de Chile, west to the Pacific, and east into the Amazon jungle , Huayna capac decided to divide it into two parts. He gave Atahuallpa (the half breed Inca) the area of Quito and the surrounding area which had been Atahuallpa’s mother’s traditional land, and the rest was left to Huascar, his second born full blood Inca son. Soon after Huayna capac died. All was reasonably serene for about 5 years, and then Atahuallpa, not satisfied with his share, sent the highly trained Inca armies which had been in Quito to protect his father south, to confront Huascar. It was at this very time that Francisco Pizarro, on his third voyage to try to find the legendary Eldorado, or city of gold that Native informants to the north had told him existed in a southern land called “Pelu”, arrived on the scene. The rest you will have to explore for yourself by buying and reading my book! My book ends with the sacking of Cuzco, the royal, military, and governmental capital of the Tahuatinsuyu by Pizarro and his rag tag ( yes I am biased) group of soldiers of fortune, and the establishment of Lima as the new Spanish capital, in the 1530’s. The descendants of the Inca did try to rebel against the Spanish over the course of many decades, but were unsuccessful. This period I have found too depressing to write about. So, in a nutshell, my book covers the origin of the Inca in Tiwanaku ( or Tiahuanaco ) in present day Bolivia, through their rise to become the largest, and perhaps most progressive Native American ( meaning all of the Americas, not just the U.S.A.) culture as regards social cohesion and human rights, through to their rapid downfall at the hands of the gold seeking Spanish. I have not only gleaned the information that makes up the book from scholarly texts written by Spanish and somewhat brain-washed Inca descendants, but also from oral traditions of the people of Peru who have secreted away what they know of their history, and have only recently revealed it to lucky searchers such as myself. My present situation is this; I am now living in Peru most of the year, and every day is filled with learning more about the Inca, through trips to Sacred sites and consulting with my Native informant friends. What is becoming most intriguing is where the Inca came from and who they were. How could a people suddenly spring up out of seemingly nowhere, with very advanced knowledge of architecture, government, and a kind of advanced democracy whereby each member of the society was cared for, and develop the largest civilization in South America in just 300 years? The answer, of course, is that they were the descendants of a very advanced culture, and this is where Graham Hancock comes back into the picture. His studies of Tiwanaku, and the amazing incites of Arthur Posnansky, a Bolivian archaeologist that studied Tiwanaku for 50 years and dared to defy the so called “conventional” archaeologists ideas of its age, are pivotal to what I am researching and discovering now. Posnansky postulated that Tiwanaku was as old as 15,000 to 17,000 years, based on his study of the obliquity of the ecliptic. I won’t bother to get into what this means in detail now, but what it suggest is that key marking stones at Tiwanaku, when adjusted for celestial alignments that have a multi-thousand year cycle, point to its construction at several, as in as much more than 10,000 years before conventional archaeologists “believe” it was made. My own recent studies, thanks to finding several stone anomalies at Sachsayhuaman, Qenqo, Ollantaytambo, and other sites in and around the Sacred Valley of Peru near Cuzco, and reinforced by the knowledge of my Native informants, show that many of the greatest achievements of the Inca were in fact made by earlier people. These people may be those that Graham refers to as descendants of those that survived the great cataclysms that occurred as the result of the massive and rapid melting of the ice sheets at the end of the last ice age, that Graham and others date at around 10,500 B.C. Other Pacific wide anomalies are also teasers, and I am following up on these, thankfully not alone. I am blessed to have Native informants, whom I have met from Hawaii, Tahiti, the Cook Islands, Rapanui ( Easter Island ) and Aotearoa ( New Zealand ) who are helping me to weave a fascinating pattern together. Collectively, they speak of a trading and societal network that stretches back several thousand years, from Peru to the above mentioned locations, all the way to Japan and Tibet. Just use the search box and enter Brien Foerster to see them all. As well, videos and slideshows that I constantly add to Facebook ( just search for Brien Foerster) and on Youtube (again look up Brien Foerster) are available for your observation and critique. I am deeply indebted to Graham Hancock, and other brilliant researchers such as Robert Bauval, John Anthony West, Robert Shock, and David Hatcher Childress who have campaigned, for decades, at not only “thinking outside of the conventional box,” but also presenting, boldly and with research, hard evidence of time frames and highly developed societies which “conventional” scholars simply can’t refute, though they try, somewhat desperately.